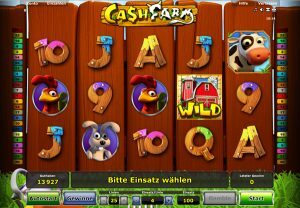 If you like digital farming games and slots, Cash Farm gives you the best of both worlds. This game was made by Novomatic Casino and has the company's signature simplicity in its design. With five reels, three rows and 25 pay lines, there are more ways to build your bankroll fast. Novomatic allows you to play this game in demo mode until you get comfortable with it. If you like farm themes, you may also like the Fruit Farm slot. From Oliver's Bar to Mayan Moons, there are plenty of other fun themed slots from Novomatic. This slot game has crisp graphics and great colour schemes. The reels move smoothly. While most slot games feature reels that spin with each round, this game has a fill-in feature with wins. The reels spin until you trigger a win. The winning symbols are then eliminated, and new symbols replace them without the rest of the reels spinning until there are no winning combinations on the screen. There is no freezing or stalling, and this slot's efficient design makes the game easier to play. Your bet level in this game can only be set by choosing an amount of coins to bet on each line. Since the lines are fixed, you must bet on all 25 lines. Keep in mind that any bet number you choose is multiplied by 25. For example, if you bet a single coin per line, your bet per round would be 25 coins. If you bet 10 coins, your bet per round would be 2,500 coins. You can bet between one and 5,000 coins per line, which means the maximum bet is 125,000 coins per round. Once your bet is set, click the start button to spin the reels. This game features a choosing bonus instead of free spins. When you spin three or more blue tractor symbols, a bonus game with bales of hay appears. A row of bales will be highlighted, and you must choose a bale from the row. If you see an arrow appear, you move on to another row. This continues until a dollar sign appears. Your winnings for the bonus round are displayed after the dollar sign appears. Some wins trigger the gamble bonus. With this feature, you can gamble your winnings just as you can in Cindereela, Book of Ra Deluxe and others. There will be a flashing card, and you must predict whether it will be red or black. If you guess correctly, you double your current win. You can guess again to double that amount. For example, if you win 50 coins from the regular game and gamble that successfully, you win 100 coins. If you gamble that win successfully, you win 200 coins. This pattern continues until you collect your win or lose the current amount. You can play this game in auto mode. There is no option to set a number of rounds or a loss amount. Click autoplay to start in auto mode. To exit auto mode, click the stop button. At the top right side of the game screen, there are several buttons. The speaker icon will adjust the sound level. The music button turns the farm sounds off or on. You can speed up the reels by clicking the arrow button, and the expansion icon lets you play Cash Farm in full-screen mode. You can always try some other slot games such as Sizzling Hot Deluxe, Ninja's Path, Pumpkin Power, Pure Jewels and others. Novomatic also makes electronic table games such as baccarat, sic bo, roulette and blackjack. These games are nice for a change of pace or if you want to increase your gambling stakes.